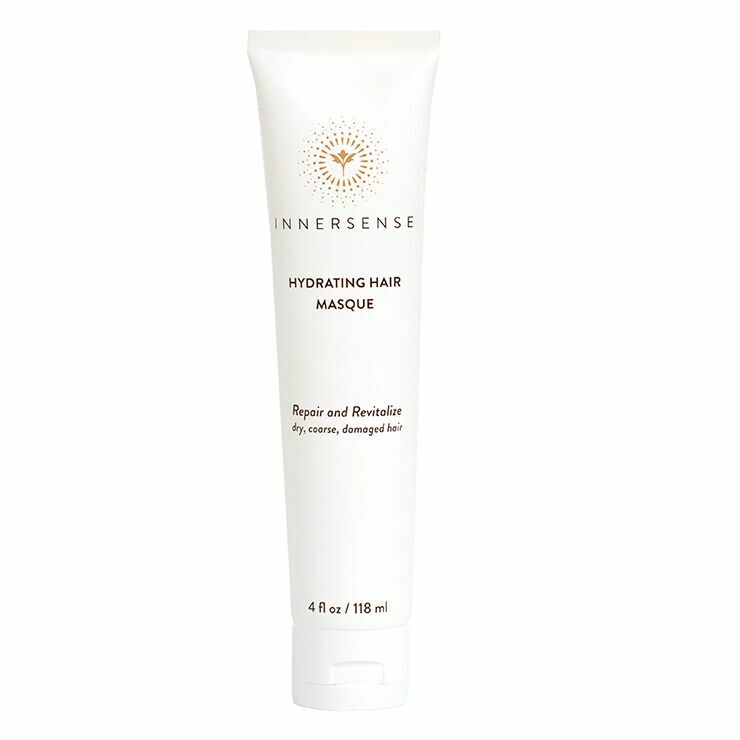 Give hair a revitalized look and feel with Innersense Organic Beauty Hydrating Hair Masque. Tamanu, Flaxseed, and Monoi Oils lend a feeling of deep-down restoration and repair to dry, coarse, and damaged hair, while Shea, Coconut, and Avocado Butters provide a look of healthy moisture and shine to parched locks. Hair is left looking healthy, and feels strong and manageable. Apply a nickel-sized amount of the organic hair masque to freshly washed hair. Adding water, massage onto scalp and work through to ends. Spend 5-10 minutes on massage before rinsing. Use regularly for smooth, healthy feeling hair. Water Water Aqua- EAU, Cetearyl Alcohol, Glycerin, Carthamus Tinctorius (Safflower)Seed Oil, Simmondsia Chinensis (Jojoba) Seed Oil*, Cocos Nucifera (Coconut Oil)*, Chloride, Behentrimonium Methosulfate, Cananga Odorata Flower Oil, Lavandula Angustifolia Stearalkonium Chloride, Behentrimonium Methosulfate, Cananga Odorata Flower Oil, Lavandula Angustifolia,(Lavender) Oil*, Citrus Aurantium Dulcis (Orange) Peel Oil*, Salvia Sclarea (Clary) Oil, Vanillin,Pogostemon Cablin Oil, Glycine Soja Oil, Cetyl Hydroxyethylcellulose, Butyrospermum Parkii (Shea Butter)*, Sodium Benzoate, Pyrus Malus (Apple) Fruit Extract, Potassium Sorbate, Calophyllum,Inophyllum (Tamanu) Oil*, Guar Hydroxypropyltrimonium Chloride, Linum Usitatissimum (Linseed), Seed Oil, Camellia Japonica (Camellia) Oil*, Oryza Sativa (Rice) Extract*, Persea Gratissima, (Avocado) Oil* Sodium PCA, Sodium Lactate, Arginine, Aspartic Acid, PCA, Glycine, Alanine, Serine, Valine, Proline, Threonine, Isoleucine, Histidine, Phenylalanine, Citric Acid, Oenothera Biennis (Evening Primrose) Oil*, Panthenol (Vitamin B-5), Taraxacum Officinale (Dandelion) Leaf Extract, Salvia Officinalis (Sage) Leaf Extract, Melissa Officinalis Leaf Extract, Hydrolyzed Quinoa, Vacciniumm Myrtillus (Bilberry) Fruit Extract, Saccharum officinarum (Sugar Cane) Extract, Acer saccharum (Sugar Maple) Extract, Citrus Aurantium Dulcis (Orange) Fruit Extract, Citrus Limon (Lemon) Fruit Extract. For reference, my hair is thick and coarse- and I use this hair masque 1x/week. It is such a fantastic product (and my favorite hair masque). My hair is so well hydrated after one use. I am still playing around with how much product to use in one sitting. I typically use the hydrating hair bath shampoo + conditioner. Put on the hair masque......and enjoy a hot bath, followed by a quick shower.